Unfortunately, we can forget about the American television networks devoting any substantive time to one major problem facing the country: racism. But this election season does provide an opportunity to confront it. Here's an exercise for you to do with your nearest racist. There shouldn't be any trouble finding them. They are in every community. 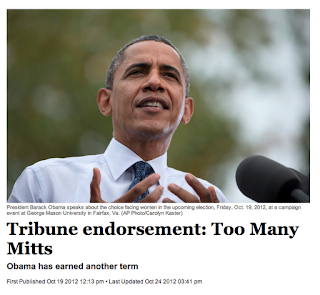 Print out the presidential endorsement from the Salt Lake Tribune. Read it point by point to your racist. Ask your racist to respond to each point. That will be sure to cause cognitive dissonance. And it's impossible to create behavioral change without first creating cognitive dissonance. The Salt Lake Tribune uses logic, reason, and facts. Racism, of course, doesn't allow logic or reason or facts. Ask your racist to use logic, reason and facts when responding to each point made by the Salt Lake Tribune endorsement and watch closely. You may actually observe cognitive dissonance. You may actually have the opportunity to see the point where the racist shows that ever so slight movement away from racism and toward thought and reason. More than likely, the racist simply won't listen. The racist will simply ignore facts and logic. Reasonable, thoughtful, rational people are not racists. Rational reasonable fact-based thinking doesn't tolerate racism. Nobody should. Nor should American news organizations consistently fail to address the issue.